Exactly what I expect to find in a 200 word RPG. Innovative mechanic that complements the story. I also love the wacky setting where you play villains putting out the sun instead of being survivors (like most other entries). Well done! Great story-telling. Straight-forward and easy mechanics for "dive-right-in" action. Love it. Question: what do players without cards do? I can see the cards are used to settle ties, but, really, that can't be "it". Except for that, I'm all over this game. Another one for the pile of "Hey, we're not DnD'ing today, what about this one?" Cheers! 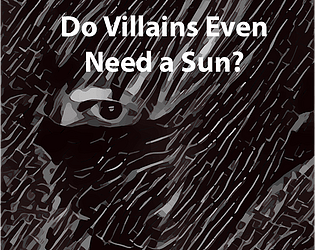 When you have no cards, there's nothing to lose by you and your fellow cardless villains having a guess at what the "top" player is and how they plan to destroy the sun. I'd have loved to add some more mechanics to enrich the game play, but it's tight in that word count! I really like the whole caper format here. I wish the risk/reward/agency mechanics were a bit more explored, but 200 is a small number. Definitely my favorite scenario in this jam. I love the whole supervillain thing.